Pope John Paul II is said to have done them every Friday year-round, knights began the tradition, but Franciscan friars popularized them, and millions of Christians devote time each Lenten season to them. So what is it about Stations of the Cross that draws people, century after century? “Like any type of ritual, I believe it just focuses or clarifies the reality of the event,” the Reverend Paul Wolf of Holy Trinity Catholic Church in Winsted said. The event which Wolf is talking about is known in the church as the passion work of Jesus Christ, which includes his suffering, death, and resurrection. His suffering and death is commemorated each Lenten season in the church, which culminates in Holy Week this week, ending Easter Sunday. 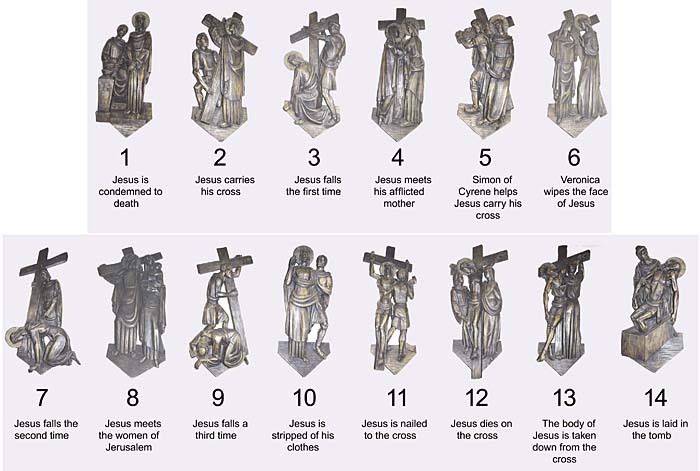 The Stations of the Cross commemorate 14 events that took place during the passion work of Jesus Christ, particularly his walk to the cross. But since these events took place 2,000 years ago, one can see how they might be hard to relate to. That’s where the stations come into play. “It is a good devotion for us, especially in our technologically advanced and fast-paced world, to remember what God has done for us  that he sent His Son,” Wolf said. Each event, or station, is illustrated by a statue or picture, and is sometimes even acted out by real people, referred to as living stations. As the priest guides parishioners through the stations, stopping to pray and meditate at each one, the events become more personal. “It is an inner journey for each one of us,” the Reverend Timothy Cloutier of St. Mary’s Catholic Church in Waverly said. The practice of stations originated during the crusades, when knights and pilgrims began to retrace the footsteps of Christ on his way to Calvary, the place where he was crucified. They were then popularized by the Franciscan friars in the 14th century. Since most people no longer travel, or cannot travel to the Holy Land, to meditate on these events each year, the stations help bring the events to them. Focusing specifically on certain events helps to clarify the picture of Christ’s suffering and death. Instead of glossing over the whippings, stumbling, and humiliation their Savior went through, the seriousness of the passion work is hammered into parishioner’s heads like the nails pounded into Christ’s hands and feet. The stations take place every Friday during Lent in honor of Good Friday, the day set aside in the church to remember Christ’s death, which took place on a Friday. The stations are practiced in both the Eastern and Western Catholic Church. Over the years, many names have been applied to this tradition, such as Way of the Cross, Via Dolorosa, Stations of the Cross, and Way of Christ’s Sorrows. Stations simply refer to the pauses made in the procession following Christ’s path to the cross, and to his death. The stations begin with Christ being sentenced to death, and end with his burial. Some churches add a 15th station to commemorate Christ’s resurrection. “The importance of the stations has to do with our relationship with Jesus,” Cloutier said. After focusing on the stations and Christ’s sufferings for 40 days of Lent, the church will celebrate Easter Sunday, April 16.